What a cracker of a day. Finally what Test cricket has been after (or England at least). Jimmy Anderson obviously had a quick peruse on NWG and decided to give his female counterpart something to cheer about, scoring 19, but off a massive 82 balls - the very definition of a nightwatchman (and showing KP how it's done). And Prior, not NWG's favourite players of all time, managed a half century, taking England's total to a well fed 316. Commentators were saying last night that England needed at least 370 to make it competitive, but given their performance in the field this morning, NWG needn't have worried. 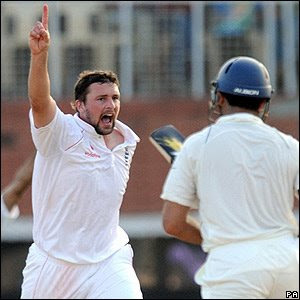 The excellent bowling from the England boys ensured all top six batsmen were licking their wounds (especially Yuvraj, who looked decidedly unsettled after each Flintoff spell), leaving Dhoni and Harbhajan to face their wrath tomorrow. Whatever the result, England have shown some fighting spirit today, something of a necessity if they're going to get through the next year of cricket. Nightwatchgirl is grateful and excited. England weren't lucky today, they showed aggression, skill and determination, key attributes for a winning side. The only downside is that NWG has been up since 5am and now feels like she should be eating her dinner. Time difference is confusing for both brain and stomach. NOw this was totally unexpected...firstly, i was expecting much more from england lower order,actully more from freddie,but anyhow they still reached 300. good effort..and Secondly,i indian batting was dissapointing,bowling was top notch, freddie was in top form..and i expect his spell to yuvraj to be the trend for the series...yuvraj hass some tough times ahead. Lastly,this match could well decide the series,i live near mohali..its been foggy for the last cuple of days and it tends to remaain liek that till 10 in the morning and with the dew around and it being winter,gets dark really quick,i dont think there will be 90 overs possible in a day.